I had such a good time watching the Joan Crawford/ Bette Davis cable TV series Feud that when its eight-episode run on the FX channel was over, it left me with both a lingering taste for biographical films that play fast and loose with the facts, and a hankering for outsized performances by actors whose scrupulously-engineered screen personas are inextricably linked to their public image. So naturally, I thought of Barbra Streisand. That is, Barbra Streisand by way of Fanny Brice; Fanny Brice by way of Funny Girl; and ultimately, Streisand and Brice by way of the misguided, contractually-mandated Funny Girl sequel—that rapturous, cotton candy fashion parade, ego-stroke of a musical guilty pleasure known as Funny Lady. When the narrative of the 1964 Broadway musical and subsequent 1968 film adaptation of Funny Girl concluded sometime in the late 1920s, we all knew there was more to the Fanny Brice story (punctuated by brief forays into film and television, Brice's success as a radio star lasted up to her death in 1951). Whether or not that story was anything worth telling is another matter. Funny Lady (which some of you may know by its alternate title: “The Back of James Caan’s Head”) is ostensibly the continuing saga of Ziegfeld Follies star Fanny Brice, who, when last seen in Funny Girl, was photogenically torchin’ on a dark stage, crying her Egyptian-eyelinered eyes out after having been dumped by recently-sprung-from-jail-for-embezzlement hubby Nicky Arnstein. An admitted highly-fictionalized account of Brice’s later years, Funny Lady picks up roughly where Funny Girl left off (very roughly, in fact); with Brice shown backstage, still-pining-for-Nicky, being served final divorce papers by Arnstein in absentia. Romantic rejection of this sort is usually the stuff of tragedy, but as this sentimental setback grants Streisand the first of many opportunities to fling her head back in classic “suffering diva” mode (treating fans to the actress’s regal profile and shapely septum) Funny Lady instantly establishes an unfortunate precedent for a musical entertainment: Streisand is at her best when Fanny is at her worst. Indeed, given the degree of care Oscar-nominated cinematographer James Wong Howe lavishes on La Streisand when in the throes of heartbreak, from a fan's point of view, the glow of a happy Fanny Brice is no match for the luminous sheen of a miserable Barbra Streisand. So, in essence, the worse things go for Fanny, the better things go for the Streisand-watchers. This is going to be a fun musical. At what point in history this all transpires is rather nebulously conveyed, for the film’s vaguely delineated timeline is actually a mashup of Brice’s real-life 1927 divorce, the 1929 stock market crash, and the onset of the Great Depression. However long it's been, clearly enough time has elapsed allowing for Fanny’s transmogrification from the optimistic, likable, gently self-deprecating “People” person of Funny Girl, to the overdressed, perpetually scowling, foul-mouthed know-it-all of Funny Lady. Funny Girl was the rags-to-riches, broken-heart-for-every-bulb-on Broadway saga of a gangly waif whose prodigious talent triumphed over humble beginnings and unconventional beauty. Audiences responded to it because it took the usual Horatio Alger clichés of the celebrity bio, added a duckling-into-a-swan fairy-tale, and crossed it with a Cinderella love story. Funny Lady, on the other hand, showcases a Fanny Brice who’s a firmly established star. Successful, confident, glamorous (to an almost parodic degree), calling her own shots, and without a single insecure bone in her body. This proves marvelous for Streisand, who gets to look fabulous throughout without once having to endure a single joke made at the expense of her looks; dominate in numerous scenes depicting her offering people professional advice and basically telling others how they can better do their jobs; and finally, she doesn’t have to be the least bit funny. This is thanks to a screenplay which has characters tell her…at regular intervals…to her face…just how delightfully funny she is. 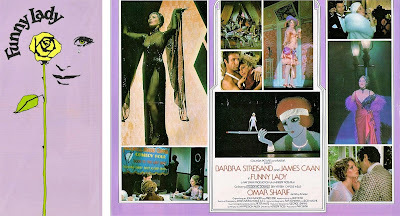 A screenplay highlighting a self-possessed Fanny Brice no-doubt proved instrumental in getting Streisand to agree to appear in a sequel she really didn’t want to do, but the lack of character conflict leaves Funny Lady with almost no narrative thrust. Sure, there’s a Depression going on, but the film has Streisand parade around in so many outlandishly glamorous Bob Mackie/Ray Aghayan outfits, Brice merely comes off as living in a bubble of privilege. Similarly, the plot sets up Brice as professionally rudderless in her post-Ziegfeld years, weathering the financial storm of the Great Depression by having to team up with novice-showman/seasoned-huckster Billy Rose in order to stay afloat. But after approximately two lines of expositional dialogue and a couple of brief exchanges, Bruce’s money woes are quickly dispatched, never to be mentioned again. Streisand in an interview; "It comes down to whom the audience wants to see me kiss. Robert Blake [an early Billy Rose contender], no. James, Caan, yes." I get a kick out of Funny Lady in spite of the fact that it’s fairly useless as biography, bloodless as a love story, and too disjointed and episodic to even satisfy as a cohesive narrative (it’s impossible to keep track of how much time has elapsed between scenes). But Funny Lady works best, makes the most sense, and proves both an invaluable source of information and entertainment when taken for what it really is: a Barbra Streisand report card. Think about it. Beyond the old “If they liked it once, they’ll love it twice” maxim that serves as the inspirational catalyst for most movie sequels; the only reason Funny Lady exists at all is that Streisand owed Funny Girl producer Ray Stark one more film on their four-picture contract. Press releases claim the reluctant Streisand had initially informed Stark that he’d have to sue her before she’d do a Funny Girl sequel, but changed her mind after reading the script. Not buying it. Anybody who’s seen Funny Lady knows that its script is more likely to instigate a lawsuit, not stop one. No. My gut tells me that Streisand agreed to appear in the sequel because, after a long musical hiatus (her last was 1970s On a Clear Day You Can See Forever) Funny Lady provided her with a showy vehicle that amounts to being a $7.5 million dollar progress report showcasing how far she’s come in the seven years since Funny Girl. Funny Lady is an investors presentation of a movie, furnishing fans and the public at large irrefutable evidence that, in spite of Oscar-winning Johnny-come-latelys like Time magazine’s “New Miss Show Biz” Liza Minnelli (Funny Lady enlists the talents of Cabaret’s songwriting team [Kander & Ebb] and screenwriter [Jay Presson Allen]), Barbra Streisand—after one Oscar; eight films; and countless albums, awards, and TV specials—still has the ol’ musical comedy poop. Funny Lady is Streisand as she enters the most self-aware (and self-serious) phase of her screen career. In this film Streisand moves to shed the old screen persona she helped create—that of the self-effacing, pigeon-toed kook with lungs of brass—and presents herself as strong, self-confident, glamorous, and in control. Admirable qualities, to be sure, but not exactly conducive to fun. In fact, this Fanny is a bit of a pill. Leaving Streisand aside for the moment (dare I? ), I’d like to give a quick shout-out to all those shuttled to the wings while the funny lady commands center stage. James Caan is one of the more underrated actors to come out of the ‘70s, and I’m as guilty as the next of never quite giving this versatile actor his due. While I’m of the mind that Robert Blake would have made the most intriguing Billy Rose, James Caan is no slouch. He's actually very good here, playing Rose as a fast-talking sharpie reminiscent of Jimmy Cagney in comedy mode. He sings well, is charming, and as Streisand co-stars go, he’s one of the strongest. Too bad the overall effectiveness of his performance is sabotaged by editing which relegates him to co-star status rather than leading man. For a gay icon with a gay son, Barbra Streisand has a pretty shady reputation for onscreen gay representation. Several of her films have characters uttering homophobic slurs (in The Owl and the Pussycat and For Pete’s Sake, she’s the culprit), and in Funny Lady, the points Roddy McDowall’s openly gay character gets for inclusion (he’s her best friend and world’s oldest chorus boy) are subverted by a script which seldom misses an opportunity to refer to him in “period appropriate” derogatory ways. I can’t speak to McDowall’s performance because, as in 1965s Inside Daisy Clover, he doesn’t actually have anything to do, but there’s something old-Hollywood comforting about seeing him. It’s doubtful Tony Award-winning performer Ben Vereen had a very sizable role to begin with, but most of what he did contribute became a casualty of all the editing Funny Lady underwent before release. Playing vaudeville entertainer Bert Robinson (a fictional combination of real-life artists Bert Williams and Bill "Bojangles" Robinson, Vereen has no interaction with the main cast at all, and with the three-minute “So Long Honey Lamb” number cut to three seconds (a bullet dodged, in my opinion); only Vereen’s dynamic singing and dancing in “Clap Hands, Here Comes Charlie” remains. He’s marvelous, of course, and gives the film a much-needed kick in the pants, energy-wise, but it feels disembodied from the rest of the action, like those Lena Horne novelty sequences in MGM musicals which were filmed in ways that made them easy to be removed in Southern theaters. It’s poor Omar Sharif who fares the worst, however. His character set up to be knocked down; so much dialogue is given over to Streisand (“No, you don’t have any lines here. It’s my turn” she actually says to him in one of Funny Lady’s many startlingly meta moments) he merely shows up, smiles, and bows out. Twice! Like a great many musicals, Funny Lady is at its best when no one is talking. The film looks spectacular, thanks to the contributions of no less than three on/off cinematographers: Vilmos Zsigmond, Ernest Laszlo, James Wong Howe; and the nifty musical score is a combination of period classics and five new numbers by John Kander & Fred Ebb (though the fan-worship pandering of “How Lucky Can you Get?” and “Let’s Hear It For Me” is so shameless you might find yourself blushing). Adding to the film’s pluses are the witty, Oscar-nominated costumes by Mackie/Aghayan, which capture the theatrical, over-the-top appeal of classic Hollywood musicals. The "Great Day" number featuring Streisand surrounded by an all-black dance ensemble (top), perhaps found its inspiration in the similarly staged "High/Low" number Ethel Merman performed with an all-black chorus in the 1936 musical Strike Me Pink (bottom). You're forgiven if you assume the above screencaps are from The Sonny & Cher Comedy Hour, The Donny & Marie Show, The Captain and Tennille, or The Brady Bunch Hour...all '70s TV variety shows looked like this. Funny Lady debuted in March of 1975, the very same month that saw the release of Ken Russell’s Tommy and Peter Bogdanovich’s At Long Last Love. Tommy was such a revelatory thrill to me that I went to see it practically every weekend during its entire run at SF’s Northpoint Theater, so by the time I got around to seeing Funny Lady, I had grown so besotted with Tommy’s mind-blowing innovation that Streisand’s film seemed positively underwhelming by comparison. Having not yet seen Funny Girl at this point—Funny Lady was just my third Streisand film—I didn’t even have sentimentality on my side (the significance of that yellow rose featured so prominently in the film’s advertising was lost on me). It was only when Funny Lady was in second-run and came to the Alhambra Theater (where I ushered) that I came to appreciate it: the patchy musical playing significantly better when viewed à la carte. These days, Funny Lady remains both a guilty pleasure and the last of the enjoyable Streisand musicals. More Grande Lady than Funny Lady, it’s a marvelous film to revisit whenever I find myself in need of a Streisand fix. A Streisand fix being akin to my Joan Crawford fixation: both being stars of such unique talents; they fascinate even when they’re awful. I like Barbra Streisand considerably more as a singer than an actress, but in these cookie-cutter times when I honestly can’t tell a bland Chris Pine from a vanilla Bradley Cooper, I find I’ve grown fonder (or at least more tolerant of) her distinctive screen persona. When Streisand is on her game (Funny Girl, On a Clear Day, What’s Up, Doc?) there isn’t anyone better. And while Funny Lady is not much of a showcase for Streisand the actress or comedienne, it’s a helluva showcase for Streisand the star. 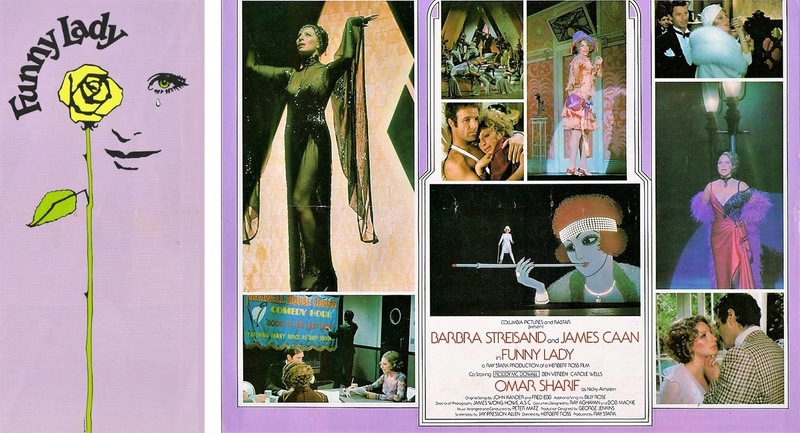 Distributed in theater lobbies: My Funny Lady promotional foldout from 1975. For those interested, the terrific The Barbra Streisand Archives offers more info than you'll likely ever want to know about the making of Funny Lady. From deleted scenes and interviews to costume sketches and behind-the-scenes trivia.